Virtual Reality and Stereoscopic 360 are still relatively young disciplines, and haven’t been standardized well. In my work I need to constantly rearrange my footage to match various pieces of software and hardware. After downloading QubaVR Stereo Swapper, simply unzip the Photoshop Actions (.atn) file into your presets folder, open Photoshop, and load it from your Actions Palette. 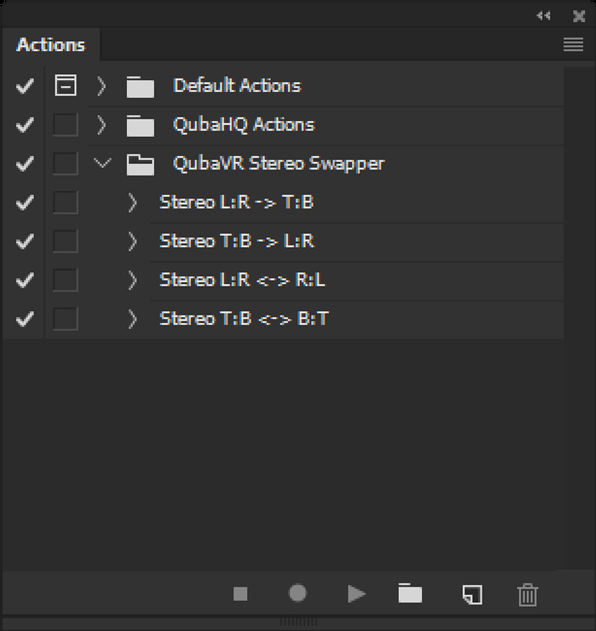 Four new actions should now be available to you under the QubaVR Stereo Swapper folder. Simply open up your image and play the appropriate action. The names should be self-explanatory: L:R -> T:B will change left-right image into top-bottom, for example, while T:B B:T will swap top and bottom halves of your image. Please note, that as a part of the action, your layer set will be flattened! That’s it, really. Simple little tool that will save you 30 seconds every time you use it, adding up to hours in no time! The QubaVR Stereo Swapper Photoshop Actions were made using Photoshop CC 2015.1.1 and may not be compatible with earlier versions. You are allowed to use this tool free of charge on personal and commercial projects. You are not allowed to redistribute, bundle or sell this tool for profit.